Read the article at the Daily Journal of Commerce. Full Circle Farm near Carnation and three others were recently certified for salmon-friendly practices. A new program that labels some farms as safe for salmon is changing how four western Washington farmers manage their land, and could influence how others do, too. In the same way buildings are ranked for their green features and wood is specially marked if it is harvested sustainably, a new eco-label can now be applied to farms, according to an independent third-party’s evaluation criteria. 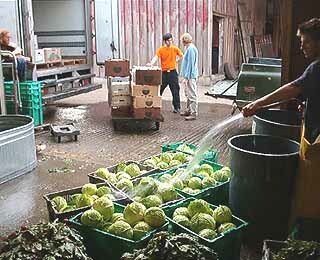 The idea is that the farms can use the eco-label for marketing and sales. Four farms in Snoqualmie were recently tagged "Salmon Safe" as part of a pilot program funded by the National Fish and Wildlife Foundation and the King Conservation District. Newly certified farms are Oxbow Farm and Cherry Creek Equestrian Center near Duvall, and the Full Circle and Jubilee farms near Carnation. Stewardship Partners is a Seattle nonprofit that runs the new eco-label program, along with a Portland organization that does the same kind work in Oregon. The organizations look at what farmers are doing to protect water quality on their sites. How farmers irrigate, control chemicals and erosion, and manage wetlands are among the criteria for the "Salmon Safe" certification. 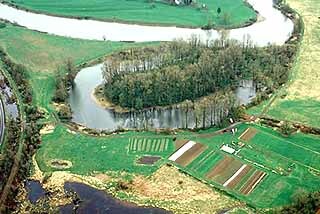 The pilot program focused on riparian sites like Oxbow Farm near Duvall. Animals are also considered. If animals are allowed to roam in stream beds, they can contribute to erosion, which clogs spawning beds for young salmon. One farm in the pilot program didn’t receive certification. The dairy farm had a culvert blocking fish from passing upstream and a "questionable manure management program," said Larry Nussbaum of Stewardship Partners. He said if the farm changes these practices, it can get certification in the future. The pilot program focused on riparian sites because of their immediate effect on salmon, but eventually other farms will also be eligible for the eco-label. Nussbaum said fundraising efforts are underway to create a similar program next year for 25 farms in the Snoqualmie, Skagit and other watersheds. In his 15 years of experience in environmental work, Nussbaum said he has changed his approach. In the beginning he was more of an environmental activist, but has started to see that more can be gained by collaborating with landowners and businesses, he said. A trip to the Amazon at the start of his career taught him this lesson, he said, as he saw there that the only useful way to protect the environment is to take care of the people who depend on it. He said incentive programs like the "Salmon Safe" label are one way to do that here.